The Sims life-simulation game genre of the last decade has arrived as a social game on Facebook titled "The Sims Social" and has within a week become Electronic Arts' largest game on Facebook, looking to soon become a $100 million yearly revenue game with a best-in-class engagement like that of FarmVille, 25% or more. Due to the fact that a main goal of the game is to form bonds with your friends, neighbor visits is an integral part of game play rather than an add-on, and is where a large amount of the available player energy is spent. This stands in stark contrast to many current-generation Facebook games, where neighbor visits is a way of gaining benefits or energy to use on the player's own game board. This new type of neighbor tending is a huge step forward, is extremely suitable for the Facebook platform, and will likely result in high player engagement. The game mechanic where a user invests in a relationship with another player in addition to his own game board, fosters extensive interactions with a few reliable friends in order to protect that investment. The story line, mirroring real life with required actions like confessing attraction, kissing and WooHoo, also promotes real friends, who you already know. The Facebook platform supports this well with its true identities, and further game design provides Facebook pictures along with the avatar strengthening the player's feeling of bond. Facebook games have been ambivalent whether an avatar should be used or be replaced by a Facebook picture. The Sims Social solves this in the neighbor bar by superimposing the customizable avatar over the player's Facbook picture and first name. This maintains the bond with the real person, as well as the monetization opportunity of an avatar system. The bar shows only 4 neighbors at a time, as opposed to a conventional 8 or 10 friends. Each friend also has a call to action "add friend" or, if the player is already befriended, relationship status. Friends are sorted by house value, an overall progress metric. A final innovation is an "Im playing!" marker for friends that are currently playing, and therefore likely to quickly respond to requests. 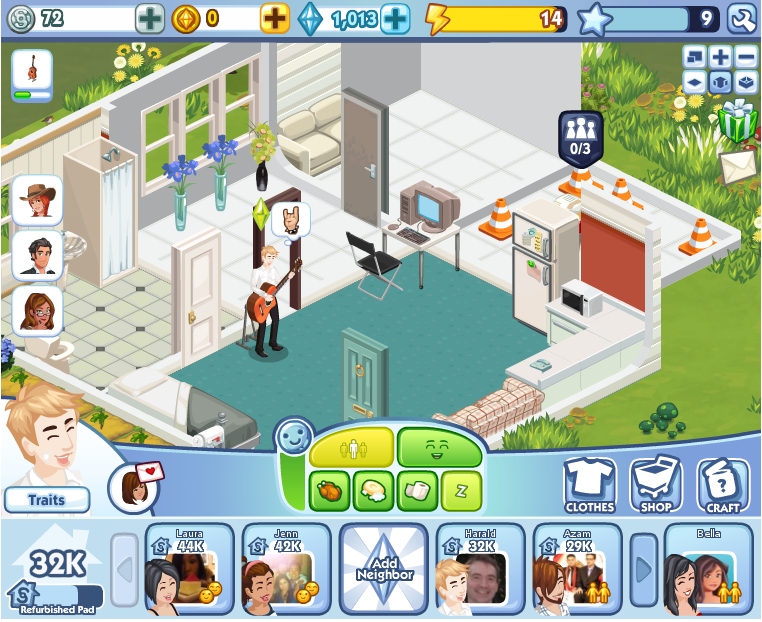 The Sims Social is a leap forward in Facebook gaming, and we are likely to see clones within the next 6 months. In future blog posts, I will outline other features, virality, and user experience aspects that makes The Sims Social stand out. We had mafias, farms, cities and wars; next will be the sims theme. Sims, don't worry: we do like you! ...totally agree with Harald. The line between what's virtual and what's real is blurring further, and this is a next wave driving up user adoption and engagement in social gaming.